Vania Red Wine Rejuvenation Facial Kit 300 g (Set of 6) Get a facial treatment done on your face to experience a soothing and rejuvenating experience with this red wine rejuvenation facial kit from Vania. 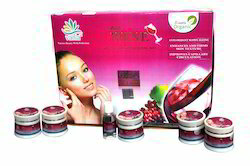 Zone aroma five fruit Facial Kit is blessing for dark complexioned skin & gives an amazing glow & skin whitening effect over a period of time. This kit is enriched with the goodness of ideal for fair look . Ingredient: Orange peel oil,masoor dal,lemon,allantion,almond oil,grapes seed oil and rose.